The sweetest way to celebrate every occasion, no nut flavors included*. 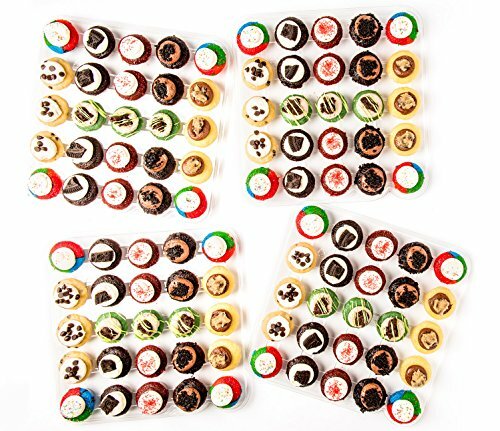 Includes seven of Baked by Melissa's most-loved original flavors, fit for classrooms and birthday parties alike. Whether they're craving a little Cookies & Cream, or going for classic Tie-Dye, there are plenty more where that came from. *Baked in a kitchen where nut ingredients are used. Contains 100 bite-size cupcakes. All Baked by Melissa goods are packaged and shipped to guarantee freshness. Bite-size treats are first hand-placed into custom-designed packs and shrink-wrapped to keep them fluffy and fresh. They are then stacked in a freezer bag with frozen gel packs and carefully placed in boxes to be delivered straight to your door! Our mindful packaging process ensures that your cupcakes will arrive fresh and beautiful anywhere in the U.S. - guaranteed! *All of our products are made in a bakery that processes peanuts and tree nuts.